Sure, there are 75 years between them, but they're equally fabulous. 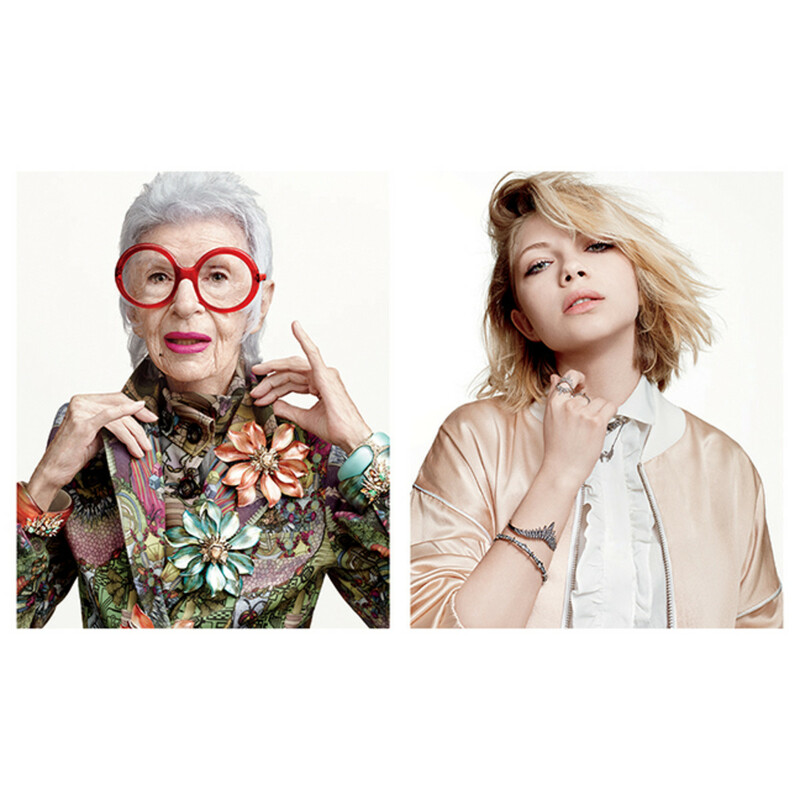 Age ain&apos;t nothing but a number when it comes to fashion ad campaigns recently: The spring 2015 ads for Saint Laurent and Céline, starring Joni Mitchell and Joan Didion, respectively, are far and away the most talked-about of the season thus far, but the inclusion of women like Helen Mirren and Jessica Lange in major 2014 beauty campaigns has indicated a major shift in a youth-obsessed industry. 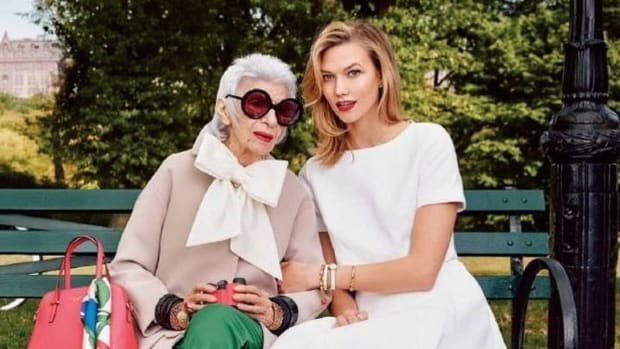 The latest designer to touch on the topic through his campaign imagery is New York-based jeweler Alexis Bittar, who cast two of the industry&apos;s most well-known names in his upcoming ads — women who are 75 years apart in age. The campaign features the 93-year-old fashion eccentric Iris Apfel alongside Tavi Gevinson — the teen blogger turned Rookie editor turned Broadway star — who hasn&apos;t yet turned 19. Shot by Terry Tsiolis and styled Arianne Phillips, the ads are meant to take a stand against the industry&apos;s inherent ageism, at least when it comes to modeling and advertising. “In terms of the fashion industry, we’re selling to women who are predominantly over 35, but we’re showing them images of girls who are 19 and retouched,” Bittar told WWD. “For the campaign, we honed in on the essence of strong women who haven’t conformed." Sure, these two ladies have entire generations between them, but considering how they&apos;ve both captivated the style set with their unique aesthetics over the years, they&apos;re equally fabulous. Keep your eyes peeled for the campaign when it debuts in February. Refinery 29 chatted with Alexis Bittar this weekend at his San Francisco shop, and the jewelry designer dropped an exciting tidbit of information. Bittar revealed that his fashion week plans involve "doing a collaboration with Iris Apfel." It has only been a matter of time before this epic partnership between the two--both known for over-the-top baubles--became a reality. This might be the season's most stylish duo. Each year the Metropolitan Museum of Art hosts sit-down conversations with the fashion elite in celebration of the Costume Institute’s exhibit. Previous line-ups have drawn large crowds, and we're expecting the same from this year's presentation, which features a pretty unique combination of personalities (and accessories). On Sunday June 17, New Yorker writer Judith Thurman--who wrote an incredible article about "Schiaparelli and Prada: Impossible Conversations" and who also wrote the introduction to the book which accompanies the exhibit--will moderate a discussion between Iris Apfel and Tavi Gevinson. Called "Good Taste/Bad Taste: The Evolution of Contemporary Chic," the museum couldn't have picked two more appropriate ladies to hash out that topic. While both participants are well known for their fondness for layering, their seventy-four year age gap is sure to account for more than a few differences in opinion (or maybe not, since Tavi is such an old soul).